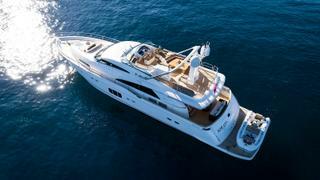 The 24.38 metre motor yacht Soraya M, listed for sale by Y.CO, has been sold to a direct client. Built in GRP by British yard Fairline Yachts to a design by Bernard Olesinski, Soraya M was delivered in 2010 and most recently refitted in 2016. Accommodation is for up to eight guests in four cabins comprised of a master suite, VIP suite and two twins, all with entertainment centres and en suite shower facilities. The saloon has settees and armchairs arranged in a U-shaped configuration around a large coffee table and an entertainment centre including a large television screen and a stereo surround sound system. Forward is a formal dining area with seating for eight guests and storage for glassware, china and silver. The main deck aft has comfortable built-in upholstered bench seating and three occasional chairs, a table and a full wet bar, making this the perfect location for al fresco entertaining and dining. Upstairs, the flybridge comes with U-shaped upholstered seating, a wet bar, a Jacuzzi and sunloungers. Twin Caterpillar C32 Acert 1,549hp diesel engines allow a cruising speed of 23 knots, topping out at 35 knots. Soraya M was asking €1,290,000.